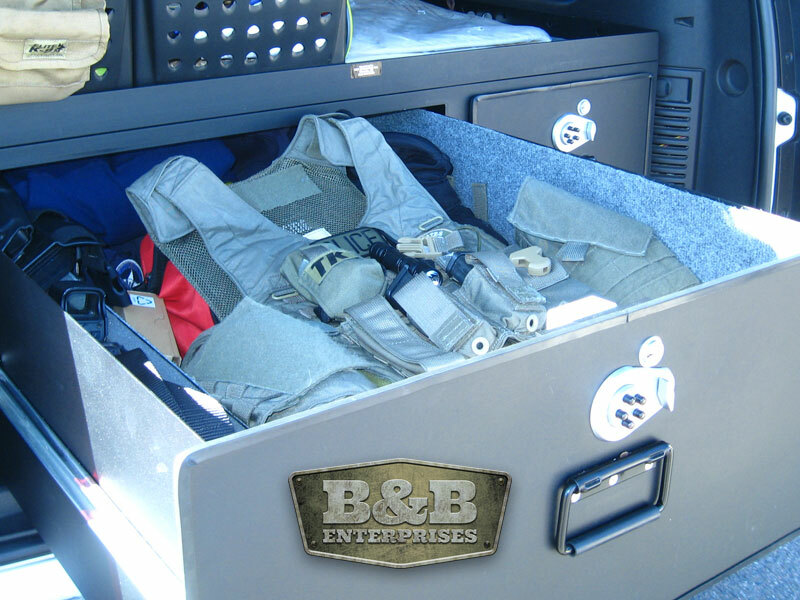 B&B Enterprises manufactures a full line of vehicle storage boxes to fit every need, from single drawer simple storage boxes to full command boxes with radio and computer mounts, white board and map drawers. We use a combination of 11ga, 14ga and 16ga cold finished steel as well as 1/8'' Aluminum Sheet to create a storage solution that is strong, durable, and user friendly. We only use Accuride heavy duty glides and all drawers are edged with rubber to reduce the excess rattling that can be so annoying. Whatever your box requirements may be B&B Enterprises has a solution for you! 225-2058 Lock Box for rear of trunk (Impala), Single drawer. Overall dimensions are 36'' long x 22 1/2'' wide x 7 1/2'' tall. Drawer dimensions are 32 1/4'' x 21'' x 5'' tall. 225-2093Single Drawer Box for a GMC Terrain vehicle, T-handle locks, 2'' lip and install frame included. 225-2302-36 Single drawer TLO Box with custom install stand for a Dodge Durango. 36" wide x 29" deep x 16 1/2'' tall includes a 2 1/2" lip to set in recess of vehicle rear compartment. 225-2339-40Single Drawer Storage Box for the rear of a SUV's and trucks, Overall dimensions - 40'' wide x 29'' deep and 15'' tall Includes Simplex locks, flat top, Fully Powdercoated all metal construction, Support Rails for install also included. 225-2348Storage Box for a Toyota 4 Runner, Includes 1 lockable drawer (41x10x26) with 2" lip on top. 225-2352Single Drawer Storage Box for the rear of a Chevy Traverse (37'' wide x 30'' deep x 16 1/2'' tall. 225-2373 Single Drawer Box for a 2013+ Ford Interceptor SUV - 36'' wide x 28 1/2''deep x 15 1/2'' tall includs 2'' lip. Includes lift up platform. 225-2383 Storage Pan for a Ford PI Utility (Interceptor), Includes a single drawer box 24'' wide x 31'' deep x 16 1/2'' tall with a side pan for cone storage (12'' w x 31'' deep). Install platform and gas shocks included. 225-2424 Single drawer storage box for a Ford Explorer (2014+) 36'' wide x 30'' x 16 1/2'' tall - drawer is 12'' deep (Inside) Includes 2'' lip around the top and install platform that allows access to the spare tire. 015-2430-348'' x 65'' x 12'' tall (Includes a 2'' lip) 2 drawer box for the rear of an Truck.Consists of two drawers side x side (approx 20'' wide x 60'' long) T-handle locks. Weatherproof Design. 225-2042-65Storage Box for a Toyota Tacoma , overall dimensions 40'' wide x 60'' deep x 12'' tall, with a two lockable drawer, side by side, Flat Top design. fully powdercoated. 225-2090 Two drawer storage box to fit the rear of a Chevy Tahoe, 44'' x 24 1/2'' x 16 1/2'' tall includes two locking drawers side by side (approx. dimensions 20'' x 24'' x 12'' tall) Stainless Steel T-Handle locks, 2'' lip around top edge, heavy duty glides, 14 ga steel consruction, fully powdercoated. Install Frame included. 225-2303 48'' x 62'' Two Drawer Box (Drawers are side x side) with a lift up lid along back side of box. Truck Bed. 225-2319-3 Two Drawer Box 48'' x 48'' x 14'' tall includes a 2'' lip on top, Drawers are side by side and includes 500 lb glides, stainless steel T-handle locks, and weather stripping. Box features rain lip, install rails, 14 ga steel construction and fully powdercoated. ****** Photo that is in file was taken after 3 years of use exposed to the elements in Texas! Truck Bed. 225-2375 Two Drawer Box for a 2013+ Ford Interceptor SUV, Overall dimensions 36'' wide x 28 1/2'''' deep x 18'' tall includes a 2'' lip. includes install stand and gas shocks for easy access to spare tire below. Drawers are stacked one above the other. 225-2375-CMTwo Drawer Box for a 2013 Ford Interceptor SUV, 37''wx 31''d x 16 1/2'' tall includes 2'' lip. Bottom Drawer 8'' deep and top drawer is a 4'' deep map drawer.Powdercoated, Install stand and gas shocks included. NON - Locking T-handles. 225-2402-D Two Drawer Box 44'' x 34'' x 23'' tall includes 2'' lip, bottom equipment drawer is 6 1/2'' deep with vented front that includes a filter system, Upper drawer is 11 1/2'' deep, to fit a standard Tahoe (2015+). Install frame included, T-handle locks. Aluminum Shell Construction with Steel drawers. 2'' lip on sides and rear of box only. T-Hanlde locks and Heavy Duty Glides. 225-2422 Two drawer Box for a Ford PI SUV Interceptor (2013+) 40'' w x 25'' d x 20'' tall with a 2'' lip around three sides, Aluminum outer shell and steel drawers for rigidity. Overall weight is only 140lbs and allows for access tot he spare tire. 225-2449 Two drawer box for a Toyota Tacoma truck 42'' X 60'' x 12'' Flat Top Design (2017 Toyota Tacoma) Includes addition of front locking bar and reinforced top. 015-2433 Includes:2 bottom Drawers, 1 large storage drawer and a gun storage drawer with Foam (this drawer extends 46'') Upper Box dimensions are 48'' wide x 22'' deep and includes a Map Board Drawer,Storage Drawer .file holder drawer and 10'' of Radio Faceplate located on the right hand side White Board Assembly located on top of box. Fully Powdercoated and Install Frame included. 015-4406Three Drawer command Box - Includes one 12'' deep half drawers on left side and a pull-out laptop tray on right side , and a full size upper white board. Overall dimensions 44'' x 29'' x 21'' tall which includes a 2'' lip. 015-4963-2BStorage Box 44'' x 32 1/2'' x 24'' tall - Includes one large storage drawer (13 1/2'' deep) with weapon slot and one pop up white board drawer (4'' deep), and one upper pull out tray with 4'' tall sides. fully powdercoated for durability (Tahoe). 225-2299 Single Drawer Box 44'' x 29'' x 20'' tall, Includes a 10'' deep lockable drawer and a Pull out Tray on top of box with 8'' screen sides. 225-2299-B Two Drawer Bomb / Swat Box with upper pull out tray. Overall dimensions 44'' w x 28'' d x 20'' tall. Includes one drawer 18'' wide with two wood lined day-boxes (ATF specs 555-209) and wood lined locking lids. The second drawer is 20'' wide for storage. Slide out tray on top has lock out glides and 4'' tall sides. 225-2307 Three drawer box with Scale compartments, Overall dimensions 48'' wide x 58'' long x 26'' tall includes 2'' lip. Two Drawers One above the other ( 32'' x 54''long x 16''deep and 32'' wide x 54'' long x 7'' deep ) left side has a 16'' x 54'' x 10'' deep and a scale rack . Access hole for spare tire and Install Included. 225-2308 Dual Storage Box (Tahoe) -Dimensions 48'' wide x 41'' deep x 16'' tall includes 2'' lip on top and dully powdercoated 14ga metal construction. One Drawer to include rifle storage slot and carpeting, second drawer to include built-in explosive box including wood lining and locking lids. All storage boxes include 500 lb heavy duty glides and Simplex locks with key override. 225-2324-41 2 door bomb box, 41" Long x 12" deep x 12" tall. Wood lining in door compartments, fits into side of utility body. 225-2417-2 Aluminum Trunk/Cargo area box with locking Aluminum Lid 35''w x 24'' d x 6''tall. Powder Coated Finish. Two Spring Handles on each side. Weighs 35lbs empty! 225-2434-WOODDual Storage Box (Tahoe) -Dimensions 48'' wide x 38'' deep x 16'' tall includes 2'' lip on top and fully powdercoated 14ga metal construction. One Drawer to include rifle storage slot and carpeting, second drawer to include an internal wood lined daybox located towards the rear of the drawer. (16 1/2'' w x 14 1/2''d) All storage boxes include 500 lb heavy duty glides and T-Handle Locks. Custom Sprinter Van This box was 36'' W x 59'' L, with two drawers, for added accessibility in a Sprinter Van. It even accommodated the storage of a tool box on the top! MCSO4844-REV1 Two Drawer Custom Bomb Box - 48'' w x 44'' d x 24'' t overall. Includes 1- drawer with 5'' weapons slot and foam an carpet lining in the rest of it, and 1 - drawer with three (3) separate wood lined day boxes (that meet or exceed ATF specs for Type 3 magazines (sec. 555.209). Upper pull out Tray includes lock out glides, front and rear screens and 4'' tall sides. Addition of inside lock guard. To Fit a Ford Expedition. MCSO4849 Custom designed 48'' x 49'' long storage box to include three drawers ( 2 standard drawers and 1 weapons drawer) with T-Handle stainless Steel locks, 2'' lip around top of box, security screen on front of box, carpet lining in the drawers and on the top of box, a 10'' x 10'' wood lined box and fully powdercoated. 015-2465 Single Drawer Box for a Ford Escape (2018) - 35'' W x 25'' D x 14 1/2'' T includes 2'' lip. Includes Install Stand. 015-2469Single Drawer Box for a Chevy Malibu (2018) - Overall dimensions 34'' W x 16 1/2'' D x 10'' Tall, Flat Top and Install stand included to allow access to spare tire in trunk. 225-2023-18DD Two Drawer Box 36'' W x 29''D x 18'' Overall,Flat Top Design, lower drawer is 36'' x 29'' x 10'' overall (8'' deep drawer) , Upper drawer is 36'' W x 19'' D x 8'' tall (6'' deep drawer) recessed 10'' from front of box - Fits a 2018 Ford Edge. Install Stand is hinged for access to spare tire below. 225-2323 Storage Box for trunk of a Dodge Charger. Overall dimensions 34'' w x 16.5'' deep x 10'' tall Flat Top Design - install frame included Fully Powdercoated Includes T-Handle Locks. 225-2372-GC17 Single Drawer Box for the rear of a Grand Cherokee (2017/2018) 36'' w x 30'' d x 15'' tall includes 2'' lip (drawer depth = 10 1/2'') Includes install stand for access to spare tire. Stainless Steel T-Handle locks. 225-2468 Single Drawer Box for a Jeep Cherokee Latitude (2014-2018) - 33 1/2'' W x 25'' D x 14'' tall , includes 2'' lip around top of box. Install Stand that allows for access to spare tire included. 225-250348'' x 37'' x 16 1/2Tall includes 1 1/2'' lip around top of box Single drawer box for the rear of a GMC Acadia. Drawer is 44'' w x 36'' l x 13'' deep with a 36'' long partition located 14'' in from passenger side. Simplex lock, powdercoated finish and Install Stand Included.